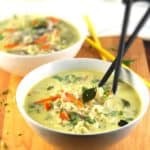 An easy, delicious, one-pot recipe for vegan Ramen in South Indian Coconut Stew that comes together in under 30 minutes and is elegant enough to serve for a special dinner. Heat the coconut oil in a large saucepan or wok. Add the curry leaves, coriander leaves and ginger and saute for a minute, stirring frequently. Add the onions, carrots, bell peppers and green chili pepper and saute over medium-high heat for a couple of minutes. Add black pepper, then half the coconut milk and two cups of water. Bring to a boil, then drop in the noodles. Cover and cook two to three minutes or until the noodles have cooked al dente. Add remaining coconut milk and salt to taste along with the tofu. If the noodles have absorbed most of the water, add some more so the noodles are soupy. Warm through but don't let the liquid boil. Turn off the heat, ladle into bowls, and garnish with more coriander leaves, if you wish.